Congratulations! You are either planning to become pregnant, or you are pregnant and we are excited to care for you! At Northwest Women’s Clinic we offer a special level of commitment to our patients reflected by the fact that 7 out of 10 of our patients are delivered by their own Provider. If you think you are pregnant, give us a call to make your first appointment. We usually recommend that you come to see us at around eight weeks following your last menstrual period. An exception would be for serious symptoms noted sooner, such as significant bleeding or pain. What is going to happen at my first Obstetric Visit? At the first obstetric visit, we like to perform ultrasound to evaluate the pregnancy and establish a due date. You will also meet with your provider. For obstetric care, we have physician providers and certified nurse midwives. Generally all providers care for patients with low risk conditions. For higher risk pregnancies, most women will see or at least consult with physician providers. Some examples are women who are carrying twins, have significant medical conditions during pregnancy such as thyroid disease, diabetes, high blood pressure, or history of previous cesarean deliveries or uterine surgery. Your provider will review your complete medical history, do an examination if needed, and review ultrasound results with you. Most of our patients have lots of questions, and we schedule time to answer them. You may find some of your questions are answered below in this information. How often do I need to be seen for obstetric care? 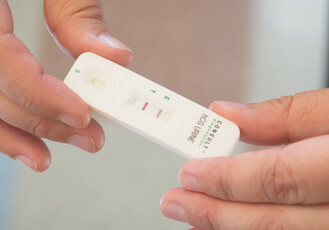 To standardize and precisely date each pregnancy, we use “weeks” and days pregnant as opposed to “months.” Pregnancy starts with the first day of the last menstrual period, and lasts an average of 40 weeks which is also the “due date.” Of course, most women actually become pregnant about two weeks after the last menstrual period. The system we use is historical from before ultrasound and highly sensitive lab tests were used, and the last period was the most reliable method for “dating the pregnancy”. We recommend a first visit around 8 weeks, and then a visit every 4 weeks until about 28 weeks. Following that, we see pregnant patients every 2 weeks until 36 weeks, then weekly thereafter until delivery. If a higher risk pregnancy is noted, additional or more frequent visits may be required. Another term you may hear is “Trimesters” which divide pregnancy into thirds. These are generally 13 weeks long, with the last being 14. For example 0-13 weeks is the first trimester, 14 to 26 weeks is the second trimester, and 27 weeks on is the third trimester. We consider a “term” gestation to be 37 weeks or later, and “full term” to be 39 weeks, with a due date on the 40th week. How many ultrasounds will I have, and how do I prepare for an ultrasound? We usually perform a first trimester ultrasound at 8 weeks to establish that the pregnancy is healthy, and determine whether there is one or more than one fetus. However, there are many other reasons your provider may want ultrasounds in addition to these, including concerns about large or small infants, observation of the developing fetus, observation of the placenta or fluid, or other reasons. Your provider will communicate with you about need for any additional ultrasounds. To prepare for your ultrasound you need only to be well hydrated! You should drink one or two 8 ounce glasses of water before you arrive. If you feel you have the need to urinate, but are not uncomfortable, then you are ready! Also, you might want to purchase a USB drive from our receptionist so we can download the pictures from the ultrasound machine for you. Do I see the same provider throughout my pregancy? Yes! We try to have you see the same provider throughout your pregnancy. However, there are times when our providers are called out for a delivery or an emergency. At these times, we offer another provider to see you, or you can choose to reschedule with your usual provider at another date or time. Where does my doctor or midwife deliver babies? We are affiliated with Legacy Good Samaritan Hospital and Providence St. Vincent’s Medical Center. These are the two facilities that we can deliver your baby. Your insurance may determine which one if not both are covered for your delivery. How do I register at the hospital? Help us to coordinate your care at your delivery hospital by registering for the hospital. We have provided the following links to make the process easier for you. Are there childbirth preparation and/or breastfeeding classes available? NWWC offers classes once a month taught by our midwife staff. Check out our clinical news page for more information about Prenatal Classes. Legacy Women’s Services provides prenatal education throughout the Portland and Vancouver area. We have provided a link to their services to assist you. Providence also offers prenatal educational classes. In order to contact your provider, call our main office line at 503-416-9922. You can ask for your provider or medical assistant and will be given the opportunity to either speak to them, or leave a voice message if they are unavailable at that moment. You can also log into our patient portal and leave them a detailed message there. We do NOT offer home births.